Psst. Want to support my writing? Find out how as little as $1 can help. 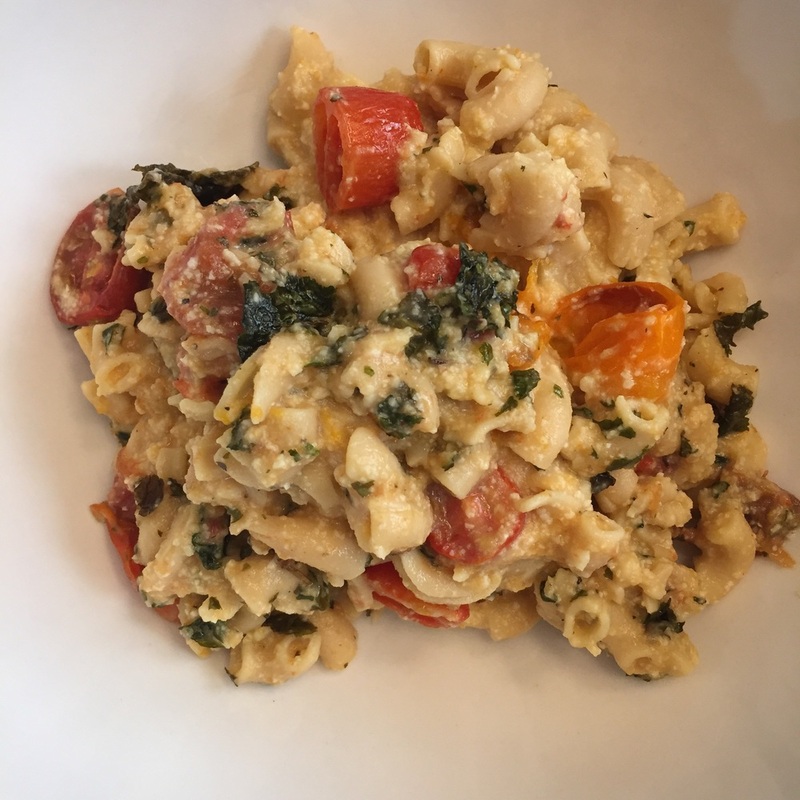 This week I tried my third recipe using Banza chickpea pasta, which contains two times the protein, four times the fiber, and half the net carbs of traditional pasta. Banza is also vegan, gluten-free, soy-free, nut-free and egg-free. It is made from chickpeas, tapioca, pea protein and xantham gum. Want to learn more about Banza chickpea pasta? Go here: eatbanza.com. Want to see the first recipe I tried? Go here: Banza Recipe #1: Creamy Avocado Pasta. Want to see the second recipe I tried? 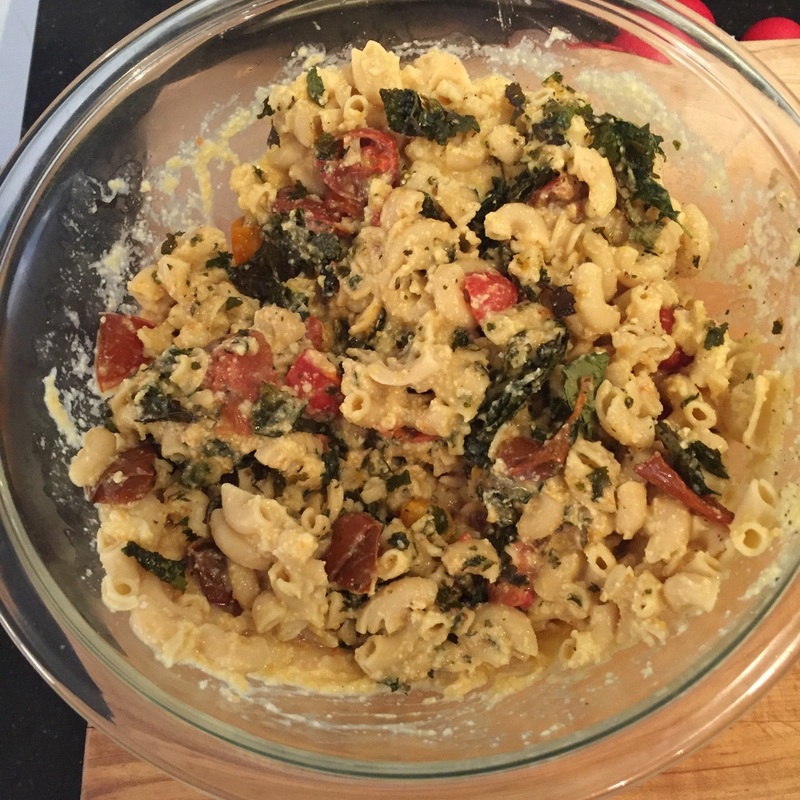 Go here: Banza Recipe #2: Mediterranean Pasta. Also, in case you missed my original discussion about it, I wanted to again make it clear that I am not being paid by Banza by they did send me six sample boxes to try. If I didn't like this pasta, I wouldn't share these recipes with you. I'm sharing them because I think this is a delicious product and a great alternative to regular pasta when you're looking for a protein or fiber boost. I knew I wanted to make macaroni and cheese with the elbow pasta, but I decided to mix things up and use a vegan recipe instead of traditional cheese. I thought a healthy pasta like this deserves a healthy pasta sauce. This sauce is loaded with veggies, nuts and spices. There's a lot of nutrition packed into this meal. For the mac and cheese I used this recipe from Vegan Yumminess. I followed the recipe closely and was happy with the results, though I would make a few changes if I make it again. 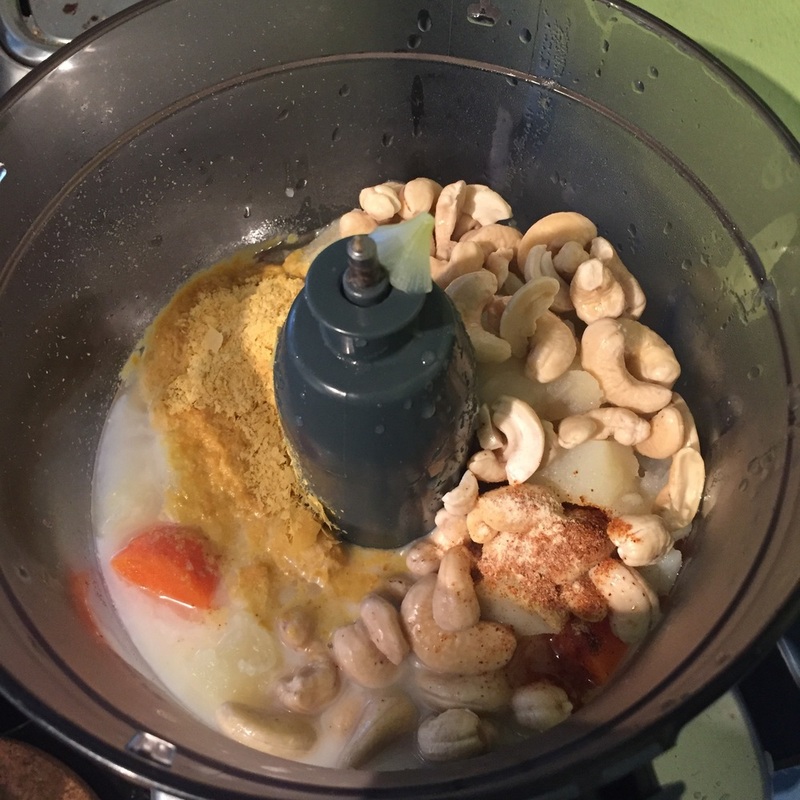 For this recipe you'll need yellow or russet potatoes, carrots, onion, water from cooking, soaked raw cashews, coconut milk, nutritional yeast, lemon juice, salt, garlic powder, optional cayenne pepper and paprika. I loved the flavor at the end, but if I were making this again I'd sub in sweet potatoes to give a little extra sweetness and creaminess. I'd also up the flavor intensity a bit by adding crushed red pepper or chili powder. Just a few tiny changes to fit my personal preferences. I love the simplicity of this recipe though: after cooking the potatoes, carrots and onion, I threw them and and everything else into a food processor, ran it for a few minutes, and voila: the perfect creamy sauce was done. While all that was going on, I cooked my Banza pasta. To reiterate from every other time I've talked about this, Banza pasta looks, feels and tastes like regular pasta. Neglect to tell your dinner guests it's made from chickpeas and I guarantee they'll never know. I love tomatoes in summertime and I especially love the combination of roasted tomatoes with pasta, so I knew I wanted to add some roasted cherry tomatoes to this dish. 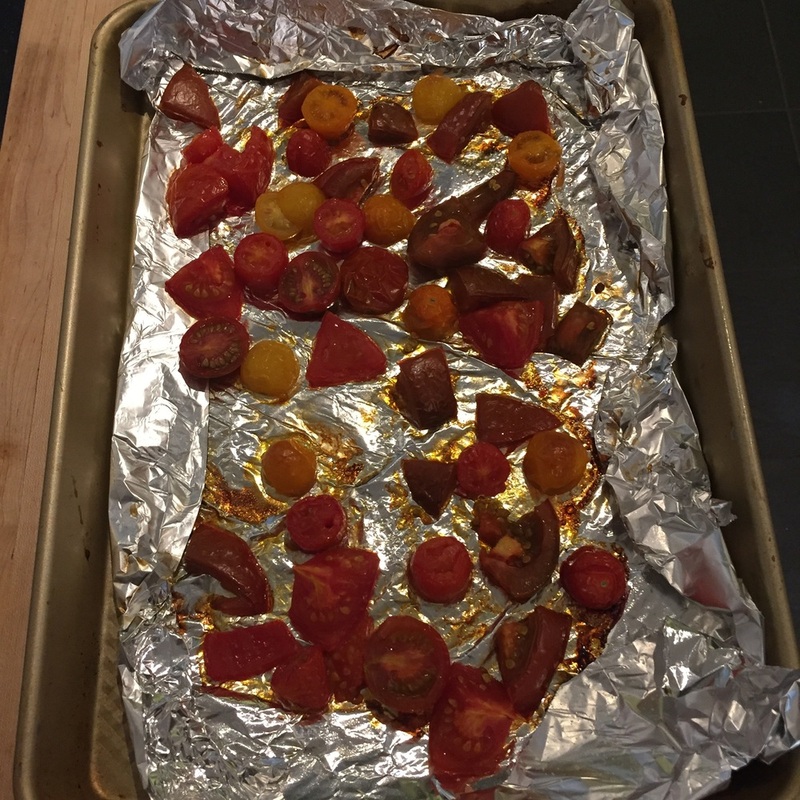 I took a container of cherry tomatoes, cut them in half, placed them on a cookie sheet covered in tin foil (easier clean-up), drizzled with olive oil and sea salt, and baked for 25 minutes at 400 degrees. I started the tomatoes first and then put together all the macaroni ingredients. Before I was pregnant, I watched a few Food Network shows a handful of times. Since being pregnant, I have watched shows on the Food Network every single day. I am now obsessed with everything from Chopped to Master Chef to Next Food Network Star to Guy's Grocery Games to Cutthroat Kitchen to Cupcake Wars to Cake Wars and everything in between. I'll even watch the junior versions of these shows despite highly questioning whether it's really appropriate for children to be facing that amount of pressure on national television. I am now truly obsessed with the Food Network and my only explanation is pregnancy. People ask me about food cravings all the time and at this point in my pregnancy, I think food cravings are a myth. Food Network cravings, on the hand, are very real. I think I got started with it because I needed to take so many naps during the day to combat my pregnancy exhaustion. It was nice to have a show that wasn't too intrusive on in the background when I was napping on the couch. But then it became a whole thing. I like to watch Food Network while I'm doing my own cooking. I like to watch Food Network while I'm cleaning. I liked to watch Food Network whenever I need a few minutes to regroup, get energized, or wind down. There is no time, really, when I don't like to watch it. My Food Network obsession plays into this dish because I knew I didn't want to just stick to a plain macaroni and cheese recipe. I asked myself: What would the Food Network judges want? I know they'd want a pop of color (the tomatoes were perfect for this) and a variance in textures. Since the pasta and sauce on their own are so creamy, I wanted to add something crunchy on the top to mix things up. An obvious example of this for most macaroni and cheeses is breadcrumbs, but I had already committed myself to making a super-healthy version of mac and cheese. 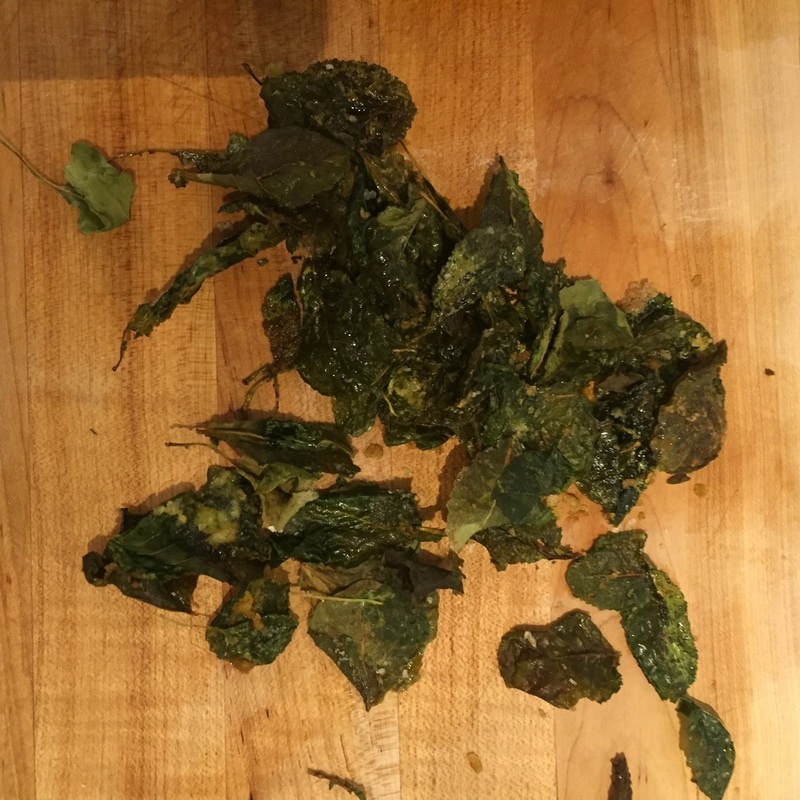 In keeping with this goal, I decided to make crushed kale chips for my crunchy topping. To do this I laid de-stemmed kale out on a baking sheet covered with tin foil and drizzled with olive oil, sprinkled with sea salt and nutritional yeast (for a cheesy flavor that's not cheese), baked for 10 minutes at 350 degrees, flipped and baked for 10 more. When they were all done I chopped them into little pieces. After draining and rinsing the pasta, I added the creamy sauce. Can you believe this was made from potatoes, carrots and onions? I've also seen vegan macaroni and cheese recipes made with butternut squash, which I think would be a nice addition. Once the sauce was mixed in, I added the roasted tomatoes. Those Food Network chefs are right: adding a pop of color elevated this dish to a new level. Next up, I mixed in the kale to give the dish even more color and also a satisfying crunch. Combining creamy and crispy textures is a beautiful thing. Creamy. "Cheesy." Crunchy. Colorful. Savory. Rich. Packed with veggies, protein and fiber, this dish is a win/win for any day when you're craving something decadent but don't want to load yourself down with cheese and butter.